Resolved to improve your DIY skills this year? Winter is the time! Take advantage of rainy days in Eugene to attend one of many classes and workshops on gardening, keeping various helpful critters, or food preservation. The Fun with Fermentation festival at the WOW Hall on January 12, 11:00-4:00, is now in its fourth year. I’ll be holding a workshop on fermentation basics — making kim chi and sampling salsa and other goodies. And that’s just the beginning! There will be plenty of fun, learnin’, and fermented food tasting for all. The OSU Oregon Master Beekeepers program starts in Eugene on January 16, 2013. See their website for details about the apprentice program and class schedules. 3:45-4:15 p.m. is an informational meeting about the Pruning Specialist Program. All MGs are welcome to sit in on classes, of course, but the public is welcome, too – $25 per class. 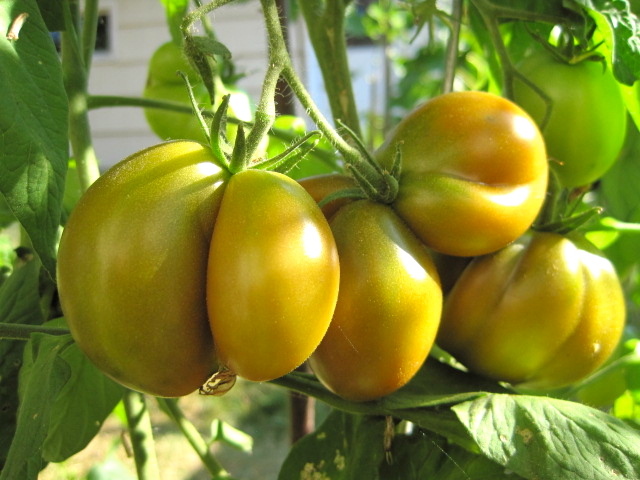 Another event: Tuesday, January 15, 2013, 7 p.m. for the Master Gardener Seminar: Backyard Homesteading with Bill Bezuk. Note new location: EWEB North Building, 500 E 4th Avenue, Eugene. Free, bring a friend. Registration is now open for three 2013 Winter Saturday Specials workshops. Take one, two or all three of the classes. Cost per class is $25 if taken individually or take all three for $60. Print off the registration form and mail check made out to OSU Extension Service to 783 Grant Street, Eugene, OR 97402. 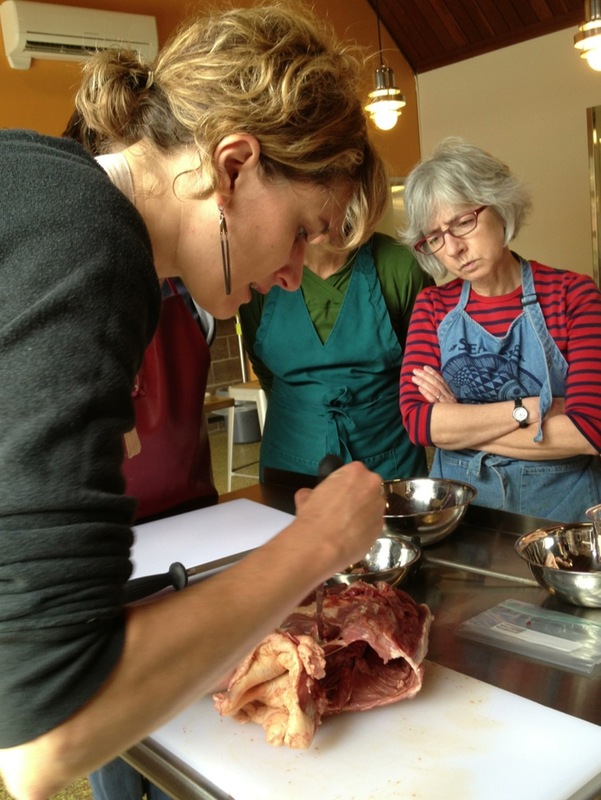 Workshops are held at the Community of Christ Church, 1485 Gilham Road, Eugene from 10 a.m. -2 p.m.
January 12, 2013 – Soups & Stews: Learn to make Lamb Basque, Moroccan Chicken, and Irsh beef stews. Soups made will be Cambodian Sweet and Sour, Cuban Moros & Christianos, and Mexican Gazpacho. All served on rice. Credit card payment $25. February 9, 2013 – Get a great introduction to the many varieties of beans and how to cook them even for dessert. Credit card payment $25. 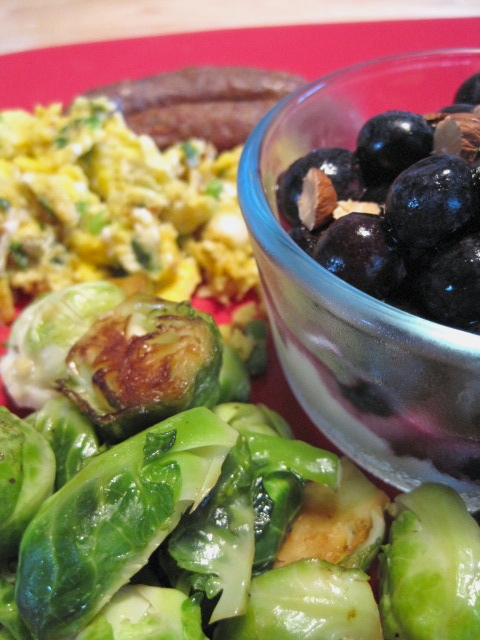 March 9, 2013 – Discover many new whole grains and grain-like foods. Learn basic cooking techniques and ways to use grains in your meal-planning for health, economy and taste. Credit card payment $25. Registration is also open for three 2013 Spring Saturday Specials workshops. Take one, two or all three of the classes: Cheese Making, Fermentation, and Intro to Canning. April 6, 2013 – Cheese Making: Learn the basics in this hands-on class. Make soft cheeses to taste and take home. Credit card payment $50. 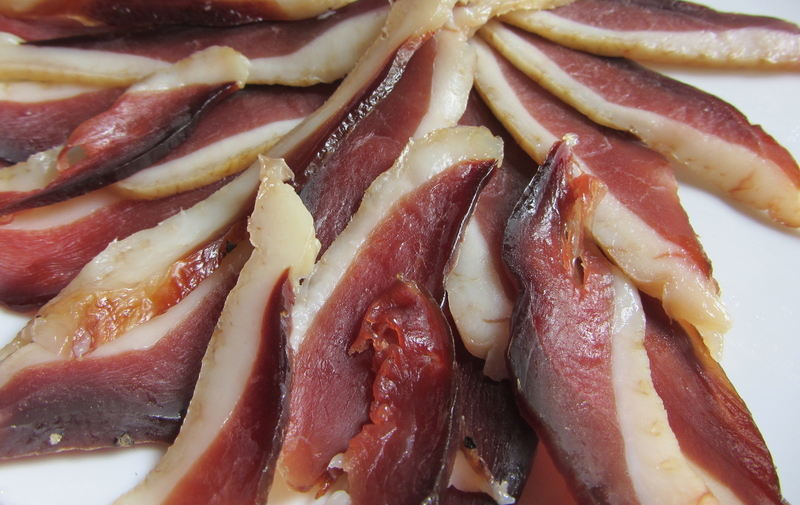 May 18, 2013 – Fermentation: Learn tips on fermenting dairy, bread, pickles and other fermented delights. Hands-on class. Limited to 12 students. Credit card payment $50. 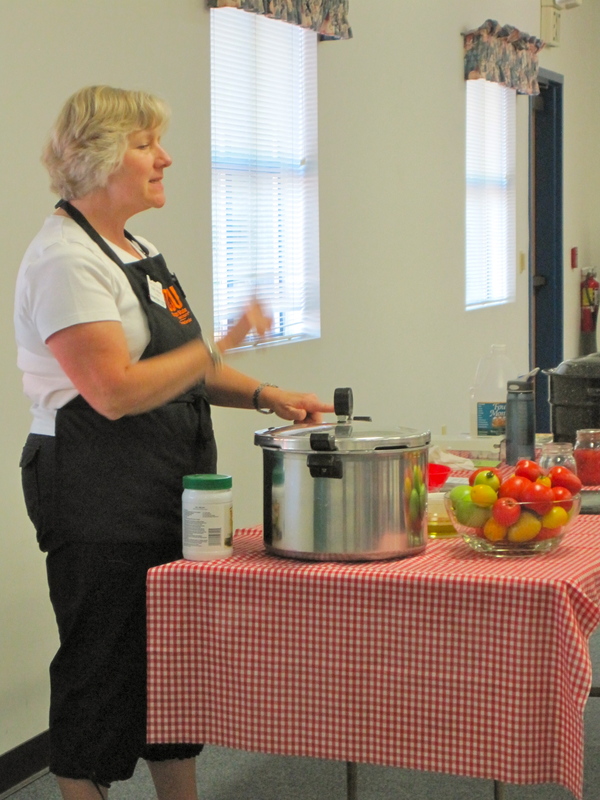 June 8, 2013 – Intro to Canning: Learn about equipment, tips for success, and what is safe to do at home and what is not. Credit card payment $20. 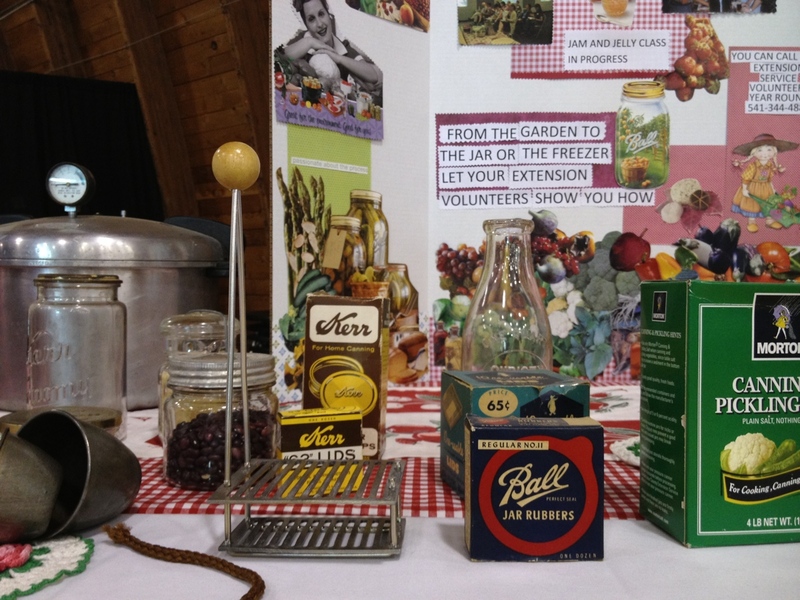 Saturday, October 13, 2012, 10:00 a.m. – 2:00 p.m.
Join the Master Food Preservers and learn to create several soft cheeses: mascarpone, uncooked cream cheese and farmer’s cheese. The cheese you make goes home with you to enjoy later. Lunch (with cheese, of course) is included, as are recipes. Class is limited to 12 eager cheese makers. Class fee $50. Saturday, November 3, 2012, 10:00 a.m. – 1:00 p.m. Smoking may be detrimental to your health? Not if you learn to smoke with the Master Food Preservers — meat, fish and cheese, that is. We’ll teach you about the necessary equipment and demonstrate safe techniques for making delicious smoked products. Class is limited to 25 students. Class fee $25. Includes recipes and samples for lunch. JUICES & CIDER. October 19, 2012: learn to use a steam juicer and press cider, pasteurize the product for safety, then freeze it or can it. HOLIDAY BREADS. December 7, 2012: learn an easy bread dough, then turn it into special holiday treats such as, tea rings, filled braids, monkey bread and teddy bears. Some hands-on. This is one of our most popular annual classes! Class fee: $15 each or $35 for all three. 6-8:30 p.m. Includes instruction, recipes and samples. All classes are held at the Community of Christ Church, 1485 Gilham Road, Eugene. To find more information about all of these classes and how to register, visit this website or call 541-344-4885. Thanks to all of you who took the poll about what you’d like to see on Culinaria Eugenius. Still plenty of time to take it! Here’s a plate of niblets that should please most everyone. One of our best classes — learn how to can tuna with our Fish Canning Expert Master Food Preserver Dale Dow. We’ll be canning sustainable albacore tuna off the boats fishing the Oregon coast, some of the best fish on earth. Nine (count ’em, NINE!) small classes: August 1, 3, 5, 6, 9, 11, 13, 22 & 24. Register and choose a date NOW. These are hands-on, 5 hour classes, limited to 6 participants each. 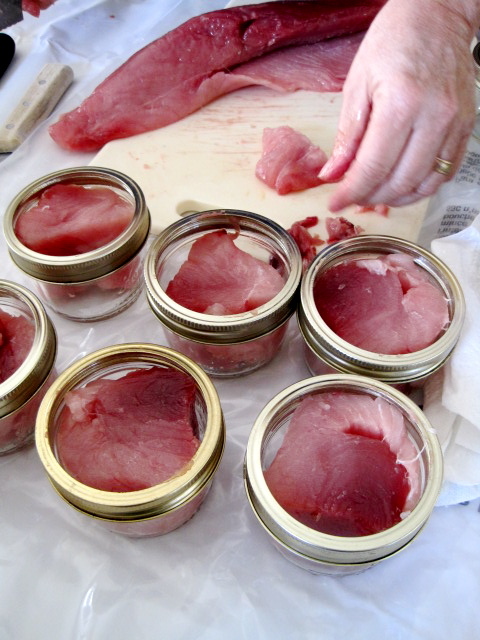 Learn to use your pressure canner and take home 24 one-half pints of tuna. $25 plus cost of tuna (at about $2.50 per jar for 24 jars); bring your own new canning jars. Call 541-344-4885 for more information ASAP and/or download registration form here. Michael Scott, whom I know via the Friendly Neighborhood Farmers Network, hosts the Cheap Thrills Supper club. This month is foods of India, and the menu is based on the sadya of the Kerala region, but ranges to all areas of India. July 30. $35 gets you a mostly vegetarian meal, sitar music, and a slide show of a trip to India. The menu looks fantastic. Several spaces left; hurry to reserve them for what promises to be a fantastic evening. It’s time to pick your own and buy one of our local miracles — raspberries. 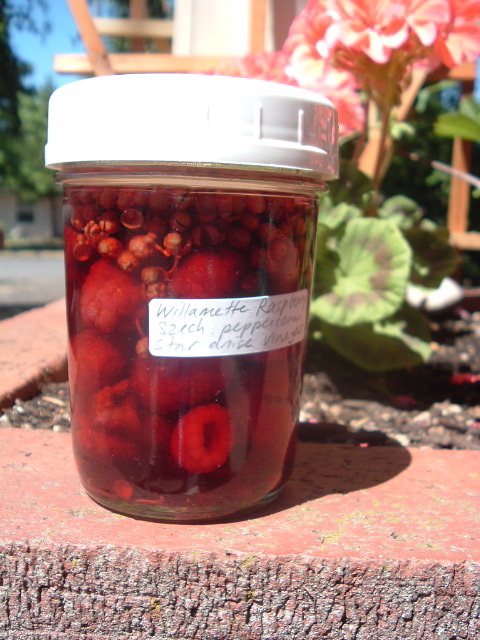 For jamming, look for these cultivars, which have a more complex flavor/acidity profile: Meekers (my favorite), Tulameens and Cascade Delights (supposedly better than Meekers), and Willamettes (the ubiquitous WV commercial raspberry and the large ones you see on bigger farms and in clamshells at markets). Wait a few days for the sun to sweeten them up again. Pick your own at a number of local farms, including Riverbrook Farm, a pocket farm on Beacon off River Road. Please comment with your favorite U-pick farms. 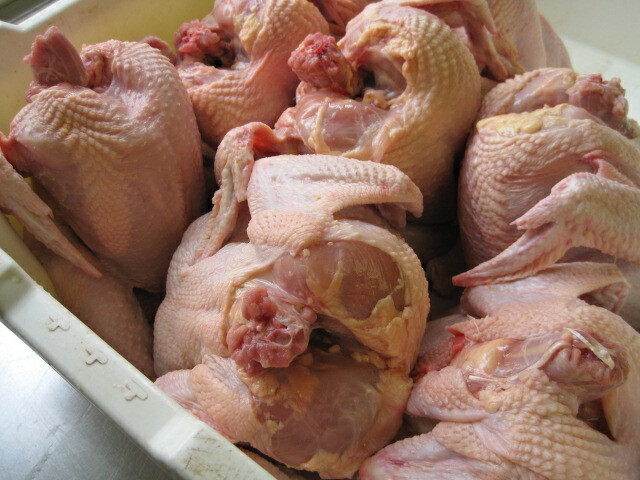 Another of my favorite local farms, Sweetwater Farm in Creswell, is now selling roasting chickens and stewing hens! I visited the plucking and cleaning operation last month out at the farm, and want to do a longer post on humane chicken slaughter, but thought it unfair not to let folks know now about the birds. I made a delicious roast chicken with one of them, and a big pot of silky broth with some chicken feet I managed to forage from the farm. :) Roasters are $4 a pound, really a fair price for pasture-raised, no soy feed birds. An order form is on their website. It’s also time to pick and buy those rarest of cherries, the evanescent ruby red pie cherry (my brandied cherries in process, above). Coming into its already short season during this freak rain, we are assured of a tiny crop. Get them now. 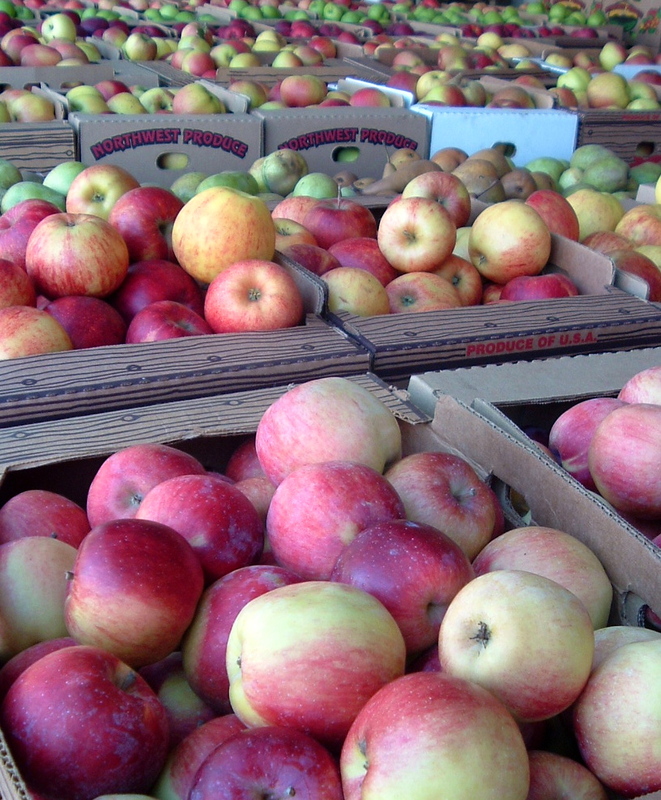 Hentze Farm is one place (where you can thankfully buy them pitted), and I think River Bend Farm has some u-pick. Any others? Master Food Preserver Patty Driscoll will be available at the Extension Service office on Thursday, July 21 July 28 between 11:30 and 1:30 to test pressure gauges [Edited to add: You may drop off your lids on July 21, but she has a meeting during that time, so plan to drop off/pick up later that day]. Be safe. Test your gauge yearly. $5. Office is located at 783 Grant, Eugene and there is parking. Bring your lid only. Speaking of fresh juice and pressure canning, I had the opportunity a month or so ago to check out the new dawning of the old Eugene hippie raw juice purveyors, the Genesis Juice Co-Op, which was effectively shut down after federal laws changed standards for processing juice a number of years ago. The same green folks who own Toby’s Tofu Paté bought them out, and they’re putting out environmentally sensitive, organic, fresh juices at Genesis Juice. I got to meet Toby, of tofu fame, and Sheldon, the CEO, of Toby’s Family Foods. We watched the crew in the processing room sorting apples and checked out the pressurizer machine. It’s a sleek, efficient operation — trading off tofu/salad dressing days and juice days. Very nice people, too.I had a chance to try their products (the standard disclaimer applies, since they were free on my visit/tour) and liked them very much, though most are a bit too sweet for me as someone finds most juice too sweet. But for those with sweeter palates, they’ll be a delight! Two items of note: (1) the fruit stays fresh and raw-tasting via a non-thermal, high-pressure pasteurization method, where the juice undergoes pressurization in a huge tank instead of being subjected to cooking to kill beasties, making a significant difference in the taste; and (2) the organic produce and HPP makes flavor variations quite apparent in different batches of the juice. I tasted one strawberry lemonade that was much tarter, for example, than the previous week’s tasting at an event. The apple juice is the closest to fresh apple cider that I’ve tasted in a commercial product, and the ginger lemonade has a nice, fresh ginger kick. Also try the Herbal Tonic, which is quite refreshing. You can get a coupon for a free bottle on their website. Excellent cucumber salad with a tiny dice, mint, and olives nestle up alongside a lamb-beef gyro at this improbably located new food cart, 4 Gyros. You’ll be greeted by a poster of a smiling woman urging you to eat GYROS and by an incredibly sweet guy: Tunisian-American and former UO Arabic instructor Mohamed Jemmali. Right now, the cart’s at 6th and Chambers, but I can’t imagine he’ll stay there long (like, hmm, maybe a week?). Food is quite good and a welcome addition to the food cart and local dining scene. Give him your business. But how can we convince Mohamed to make Tunisian couscous and stews? I asked; he said it would be too hard in the cart. I say nonsense — sounds like a campaign to me! Let him know we can handle more authentic Middle Eastern food in Eugene, and it’s up to him to do it. Once a week? Once a month? Please! And I don’t know for how long, since the internet has failed to even confirm the product exists. But I ate almost an entire bag, so I can assure you they do (did). This is the only shelf product I’ve written to a manufacturer about after being dumped for low sales, begging for its return. They’re like salt and vinegar chips, but with dill. At Capella’s Market now. Don’t wait. And I have to end this with a neighborhood delight, Josh Chamberlain from J-Tea literally shaking his moneymaker. He’s been serving up Taiwanese-style frothed iced oolong this summer. I sampled one this spring, and it’s very fun to watch. As soon as it actually TURNS summer, I can’t wait to have him shake me another tall, frothy cool one. One of my favorite local farms, Hentze Farm, is having their annual cherry festival this weekend, July 16 and 17. I’m planning to sling preserved cherry products for the crowd on Saturday as part of the Master Food Preserver demo station. We’ll be answering questions about how to preserve summer tree fruit and berries. Come out to Junction City to say hello! This might be the only week (they tell me) for U-Pick cherries, and you can also buy other fruit and vegetables. There will be BBQ, live music, and farm animals and games for the kids. Kids and adults alike may enjoy the cannery equipment that sets this farm apart from others, too. The family bought up some of the machines that cut beans, pit cherries, and strip corn, so you can always get your farm-fresh produce prepared for convenience there. Each year, I buy a 10# bag of freshly pitted sour cherries for brandied, frozen, and dried use during the year. 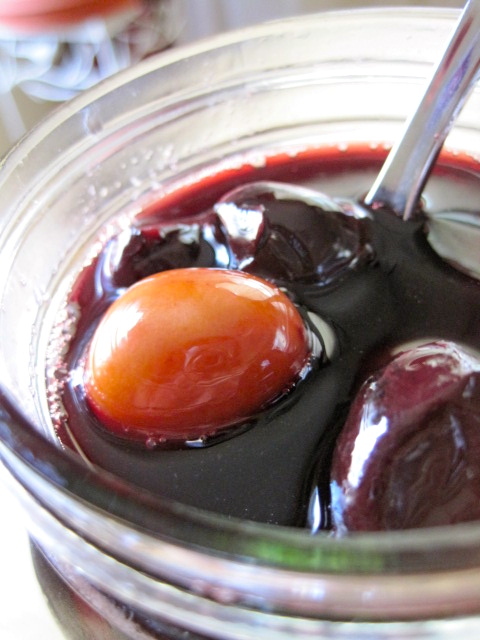 The leftover juice can be turned into a sour cherry jelly or syrup. I’ll be bringing my pickled cherries to sample as a prelude to my demo at the upcoming “Intro to Pickling” class on July 22. We’re nearly full but if you’re desperate to learn how to pickle, it’s from 6 to 8:30 at the Community Church of Christ, 1485 Gilham Road. Call 541-344-4885 for information on how to register. The class is $15 or you can still buy all three remaining classes (pickles, tomatoes & salsa, meats) for $40). Believe me, once you taste these, you’ll want to include them in your repertoire, so I’m including a recipe here! My pickled cherries use the classic Chinese five spices as flavoring: star anise, cinnamon, clove, Sichuan peppercorn and fennelseed. These spices all work beautifully with cherries individually — why not put them all together? As they mature for a month or so, the vinegar and spices mellow to produce a sweet, sour, spiced pickle that is absolutely delicious with roast pork or duck. Imagine it alongside a thickly cut pork chop from Biancalana Pork, for example. You can use fresh Bing (dark sweet) cherries or premium frozen ones (the bigger the better) for this recipe. I used Hentze’s frozen cherries from last year, already pitted, since the crop wasn’t quite ready. And a pint of fresh Queen Annes for some color variation! The cherries are prettier if you leave the pits in, and the pits add a nice, slightly almond flavor to the brine. Be sure to plan ahead for this recipe, as it sits for several days on the counter and then needs to rest for a month or so. Stem the cherries and pit them, if you wish. Let cherries sit overnight in the vinegar in a non-reactive bowl. 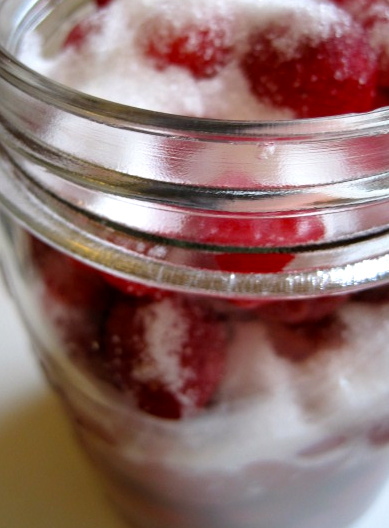 In a non-reactive saucepan, add sugar, water, and spices. 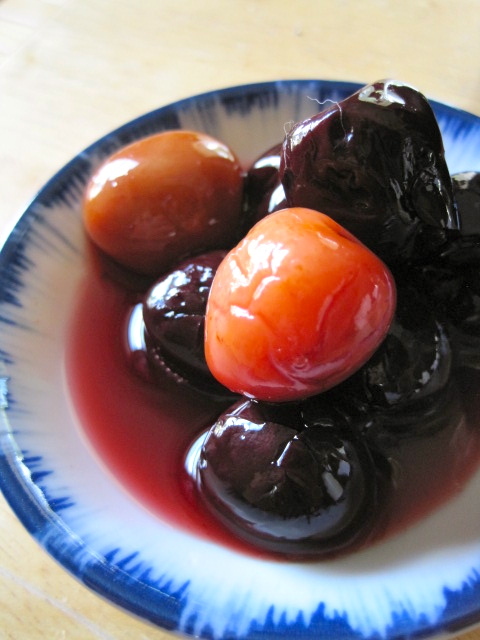 Drain the vinegar from the cherries into a bowl or directly into the saucepan if you are bold. Place the cherries into the non-reactive bowl. Heat the vinegar mixture to a boil, then simmer for 10 minutes. Let the liquid cool to room temperature, then pour over the cherries. Cover with a plate to submerge, and put a towel or plastic wrap over the bowl. Let sit at room temperature for 2-3 days. Drain the liquid from the cherries into a non-reactive saucepan. Remove the cinnamon stick and strain the spices (if you wish). Boil the liquid. Simmer for 10 minutes. Let cool to room temperature. Clean and sterilize 3-4 pint jars. Scoop the cherries into the jars, leaving room for quite a bit of liquid. Pour the liquid over the cherries in the jars, leaving an inch or so headspace. Cover the jar with a non-reactive cap (the plastic ones are fine, but metal lids/rings are not) and store in the refrigerator for a month before eating. Keeps for many months.